Fixed engine in this context refers to nets. i. 400 metres either side of the West Groyne Head No 2 light (50 degrees 55.55 mins.N. 000 degrees 46.7 mins.E.) at Rye Harbour and 200 metres seaward of the mark of the lowest astronomical tide. ii. 400 metres either side of the Eastern Bank (50 degrees 45.52 mins.N. 000 degrees 09.02 mins. E) at the entrance to Cuckmere Haven and 200 metres seaward of the mark of the lowest astronomical tide. iii. 400 metres East of the landward end (50 degrees 46.9 mins.N. 000 degrees 03.6 mins.E.) of the East Pier and 400 metres West of the landward end (50 degrees 46.75 mins.N. 000 degrees 03.22 mins.E.) of the West Breakwater of Newhaven Harbour and 200 metres seaward of the mark of the lowest astronomical tide. iv. 400 metres East of the landward end of the Eastern Breakwater (50 degrees 48.7 mins.N. 000 degrees 05.44 mins.W.) and 400 metres West of the landward end of the Western Breakwater (50 degrees 48.79 mins.N. 000 degrees 06.37 mins.W.) of Brighton Marina and 200 metres seaward of the mark of the lowest astronomical tide. v. 400 metres either side of the landward end (50 degrees 49.59 mins.N. 000 degrees 14.8 mins.W.) of the Western Breakwater of Shoreham Harbour and 200 metres seaward of the mark of the lowest astronomical tide. vi. 400 metres either side of the landward end (50 degrees 48 mins.N. 000 degrees 32.41 mins.W.) of the Western Arm of Littlehampton Harbour and 200 metres seaward of the mark of the lowest astronomical tide. 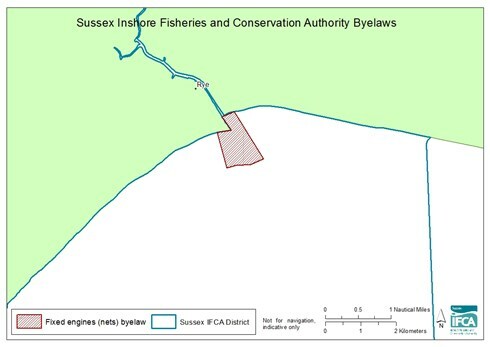 C. No person shall place or maintain any fixed engine across or partly across any channel or creek north of a line drawn across the entrance to Chichester Harbour from East Head (50 degrees 47.3 mins.N. 000 degrees 54.6 mins.W.) to Sandy Point (50 degrees 47.2 mins.N. 000 degrees 56.1.mins.W.) 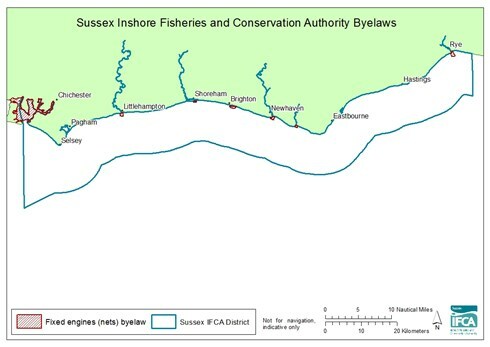 between the commencement of the last hour before low water and the expiration of the first hour after low water and in the case of any channel or creek or part thereof which becomes dry at low water, during the period between the commencement of the last hour before the tide leaves the channels or creeks or part thereof and the expiration of the first hour after the tide had begun to re-enter the same, between the 1st day of October and the 30th day of April of the following year, both days inclusive. ii. Keddle Net stands licensed by Rother District Council under terms of a lease dated the 6th day of February 1986 made between HM the Queen, the Crown Estate Commissioners and Rother District Council.